Mobilizations to stop the austerity measures of Philippe Couillard’s Quebec Liberal government got a boost in late March, after a meeting of the Front Commun, the Common Front of Quebec public sector trade unions. Then the student movement brought over 70,000 protesters into the streets on April 2, its largest mobilization since the 2012 strike. Demonstrations have been taking place regularly – on campuses and in the streets. 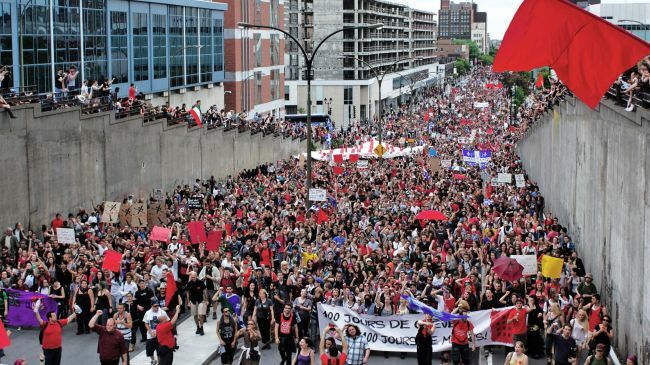 To discuss these events, police and campus reactions and the debates about what to do next, we talk with Marianne Breton Fontaine – student activist from Université du Québec à Montréal and Media Mornings contributor. Discussion starts at 38 min mark. Also news, music and weather.